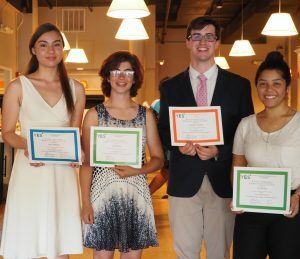 2017 Richard William Memorial Scholarship recipients; Anna, Julia, Chris, and Laura. mmunity service. The vision is to recognize students who want to challenge and inspire, as YES founder Richard Williams did. Enrolled in a public or private high school. Participation in Youth Enrichment Services programming. Excellence in community service and willingness to serve. Spirit of caring, belief in self and others. Complete an application for the Richard Williams Memorial Scholarship. Include a 500 word personal essay telling the Scholarship Committee something unique, special, or important about the person you are and your commitment to community service. Two letters of recommendation from school counselor, principal or teacher on official letterhead. An official high school transcript. Verification of College Prep one-on-ones. A resume, which includes honors, awards, extracurricular activities, community service, and employment. Current scholarship applicants, click here to access YES’s Dollars for Scholars page.